Studying Honours in Media is your chance to get an edge in the media industry while investigating a project you’re truly passionate about. Honours combines units of study with a thesis focused on a topic you devise yourself. Your research can investigate virtually anything in media, from politics to podcasts. You will complete your project supported by your supervisor, an academic whose expertise aligns with your topic, and whose combination of research and industry experience will guide you through. Research skills are vital to any career in the media industry, from journalism to corporate communications. Honours is an excellent way to get an advantage in the job market, lay the foundation for a higher research degree, or work towards becoming an expert in your chosen field. In 2010, Lucy graduated with First Class Honours in Journalism. 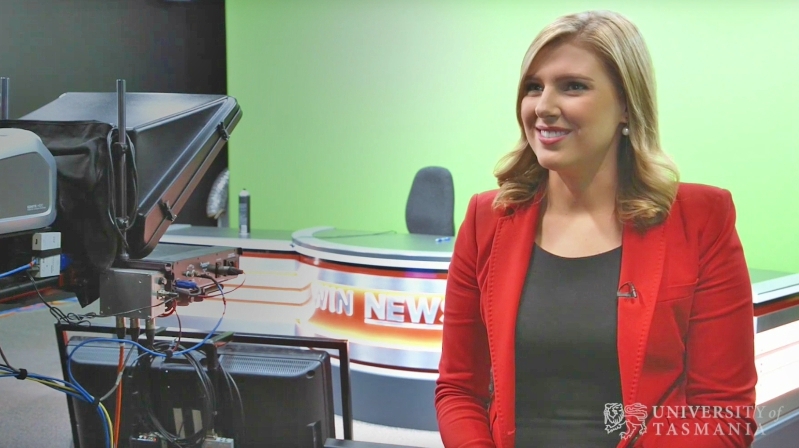 Only a few years later she found herself sitting behind the news desk at WIN Television bringing the news to Tasmania for the first time. Today, it's her job five nights per week. Understanding the media is now an essential role in a range of careers. By combining analysis of media industries, and the production and consumption of media, you will gain the knowledge and skills needed to work in a broad range of professions and environments. and an elective coursework units (25cp). In your first semester you will complete the first research project unit alongside the compulsory coursework unit. In your second semester you will complete the second research project unit and an Honours coursework elective. Bachelor of Media (or equivalent) units.